The meeting was chaired by VADM Emil Eftimov, BGR DCHOD. In his opening speech he elaborated upon CMDR COE’s annual achievements and prospects, noting that “During these past years, the Centre has generated a wealth of information and expertise in the field of crisis management, disaster response, prevention, mitigation, preparedness, and recovery. 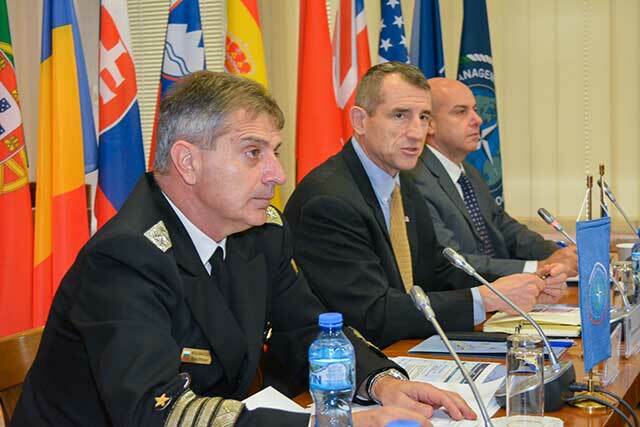 Based on its efforts up to now, CMDR COE is able to bring expertise to partners and collaborators in applying the comprehensive approach in crisis management and disaster response”, stressing that the Centre’s plans are to disseminate the relevant knowledge gained whenever NATO conducts training courses and exercises for governmental bodies and local officials. CMDR COE was honoured to welcome Major General William Hickman, DCOS, Strategic Planning and Policy, ACT to the 5th SC meeting. During the event MG Hickman held an official meeting with the CMDR COE personnel. He expressed his willingness to support CMDR COE efforts to enhance expertise by additional NATO members and partner states, joining as CMDR COE sponsoring nations. MG Hickman elaborated on the current international challenges, among which are the lack of resources, immigration, as well as the political, economic and social instability. He emphasized the importance of stakeholders working within the CMDR domain, as well as the development of CMDR COE training and educational capabilities through cooperation with HQ SACT E&T bodies, the promotion and development of various CMDR COE projects at the HQ SACT level. During the 5th Steering Committee meeting, the SC members deliberated on a number of items including the proposed CMDR COE Programme of Work for 2018, as well as the Budget Estimates for FY-2018. Eventually, all proposals were approved by consensus. The fifth CMDR COE meeting concluded on a positive note with a tour de table and a closing ceremony held by the CMDR COE Director.